Today I had a great phone call with a health care social media friend I met on Twitter. He asked me a few questions about my work. I think he was trying to make sense of my wild and varied tweets and the business model behind them. 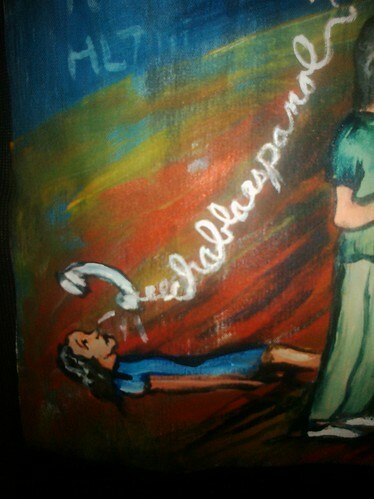 I talked about my patient speaking, my painting and the Walking Gallery. 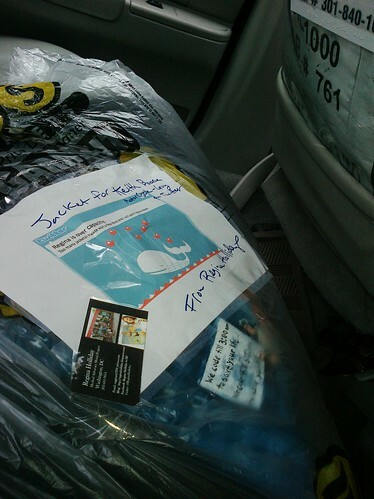 I mentioned my blog and the amazing power of twitter to spread an advocacy message. I spoke of my 8 years teaching art. My 16 years working retail. I mentioned my work as a den leader in Cub Scouts. I spoke about my involvement with Social Justice Camp DC and the workshops and rummage sales I organize to help the homeless. And I think I said all of this without pausing for a breath. After I was neatly compartmentalized within his world-view, we continued the call. I think he might join the Gallery. It was a great call and all of his questions made me think of someone else I know: Howard Liebers. I once asked Howard a very similar type of question. What did Howard do? Or perhaps the better question would be: What doesn’t Howard do? I met Howard on Twitter after he followed me on June 24th, 2010. 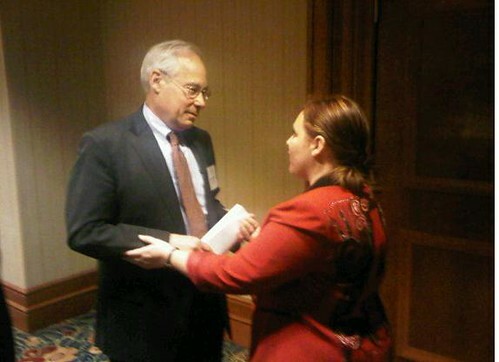 He had heard of my work from a friend of his who heard me speak at The National Partnership for Women and Children. 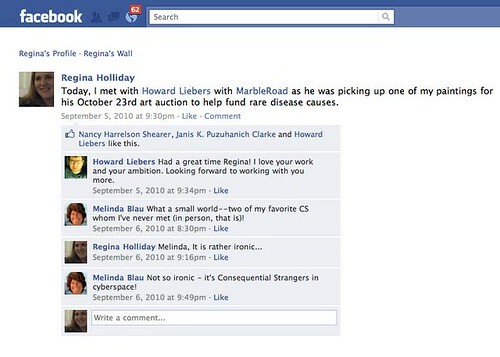 Howard was organizing an art benefit in the fall and wondered if I could donate a piece of art. I said sure, but warned him he would have to pick it up. On September 5, 2010 Howard came over to the apartment. That day I learned about the many hats of Howard Liebers. Howard came over on a busy day. That had to push my son around in a stroller while posting signs throughout the neighborhood about an upcoming Rummage sale to fund the homeless shelter and a Cub Scout membership drive. I immediately put him to work helping to hang the signs. He was rather stressed by the haphazard way I applied the tape. He made some comment about the way the signs were slightly crooked with tape off center, would cause the reader concern about the mental state of the sign poster. I laughed and told him I believed in truth in advertising. So walked around in the late summer heat of DC, and spoke of health and art and advocacy. I learned that Howard started his career with an AmeriCorps program called Community HealthCorps. His full time job is working for DC Primary Care Association (DCPCA) on policy for community health centers throughout the District, and on implementation of aspects HITECH and health reform. I learned that Howard started his advocacy because of a friend’s rare disease: non-Hodgkin’s Lymphoma. Howard’s friend died before the age of 25. 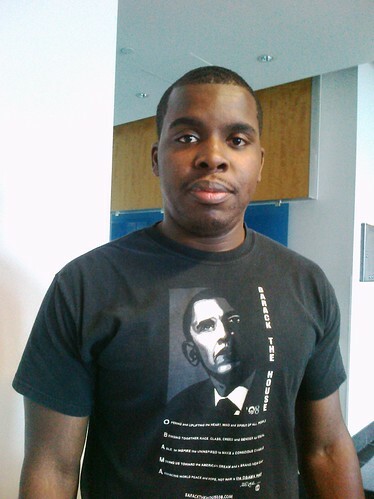 As a result of this and due the growing realization that many people have no time left to wait for change, Howard founded MarbleRoad: a non-profit, incorporated in Washington, DC in 2010. 501(c)(3) status is pending. The mission of MarbleRoad is to connect people who have complex illnesses with the resources they need to help them improve their lives. 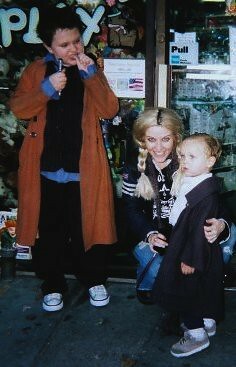 That day Howard gave both my sons bags of marbles to remind us of Marble Road. Howard is also involved with NORD “The National Organization for Rare Disorders (NORD), a 501(c)(3) organization, is a unique federation of voluntary health organizations dedicated to helping people with rare "orphan" diseases and assisting the organizations that serve them. NORD is committed to the identification, treatment, and cure of rare disorders through programs of education, advocacy, research, and service.” (As defined by their website) And after we spoke of these things I started talking with Howard about Jack Klugman from Quincy, ME and the actor's involvement in passing the Orphan Drug Act. I was so glad to hear that Howard was aware of that back-story. Finally Howard led the conversation back to the reason he was here. He was inspired by organizations such as The Society for the Arts in Healthcare. 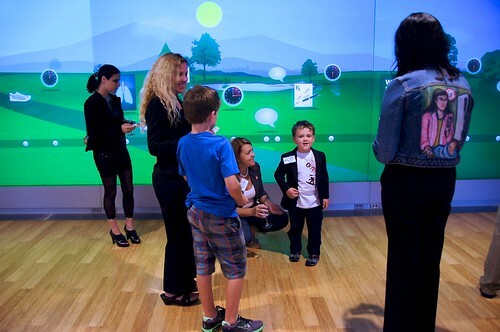 Their mission to advance the arts within health care, fit in so well with his vision of the potential of MarbleRoad. Hence, he was doing an art auction to help fund his charity. Anyway, it was a fun evening. It wasn’t hugely attended but there was an amazing spirit of giving in the air. And that night I saw the final two hats of Howard Liebers prominently displayed. Howard is a good friend. He has friends throughout the country who love and support him, and he does the same for them. And Howard is good son. His eyes shone with pride as he introduced his family to his wide world of advocacy. He sparkled as walked through the crowd and brought us all together. 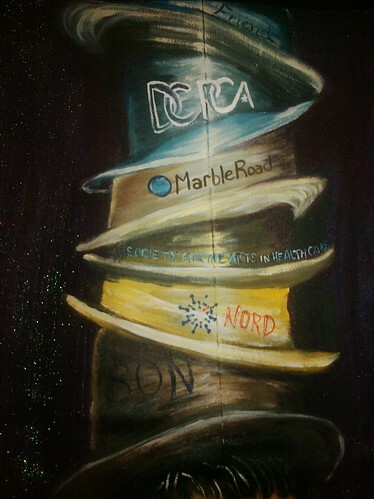 So that is the tale of the Many Hats of Howard Liebers and he is a member of The Walking Gallery. And he is the only member of the Gallery with glitter on his jacket, because Howard is like his marbles. He is filled with inner flecks of brilliance. Howard sparkles with life and he is a True believer that we can work together and save the world. One marble at a time. When I first dove into the world of medical advocacy, I had a very sick husband. Time was of the essence, and I combed through entry after entry about searching for treatment options within streaming lines of content. The pictures that accompanied the research were stock photos of plump happy “patients.” It bothered me. Where was the reality in this? Where was the soul? After my husband Fred died, I began to do massive amounts of image research online to better prepare me for my painting advocacy. 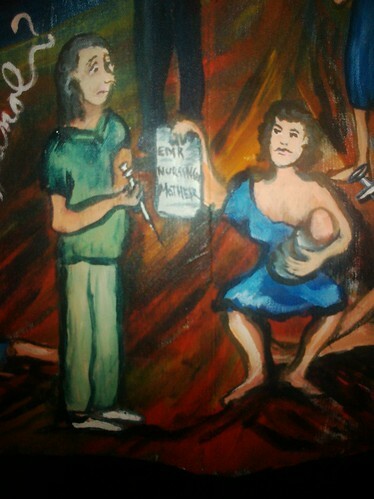 I grew more and more resentful of the way providers and patients were depicted. I grew outraged that there were so few strong visuals depicting the reality of health information technology, patient safety and patient rights. My thoughts buzzed within my head, not unlike an angry bee, as I found image after image of stethoscopes on keyboards to symbolize electronic medical record technology. And saw far too many pharmaceutical companies and hospitals create warm and fuzzy visuals of the “Rainbows and Butterflies” variety. 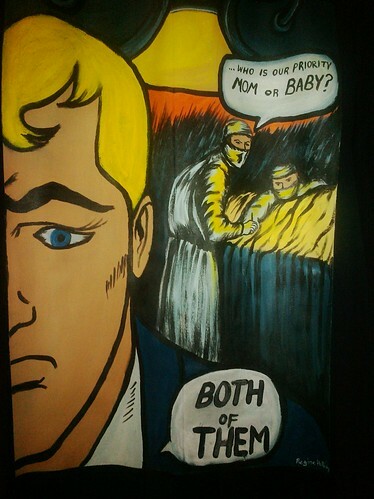 Often to appropriately depict the type of scenarios patients were going through, I had to research instead the expressive realism of religious art and icon paintings. I would express my frustration at the unrealistic visual depictions within modern medicine to a select group of my Twitter friends. Both Becca Price and Ted Eytan would often listen to my anti-stock photography rants that I would express in 140 characters or less. 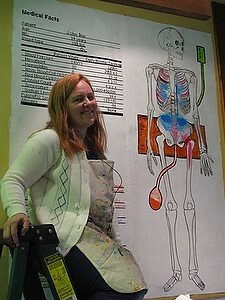 Another person who would hear my frustrations about the lack of good visual depictions would be Lindsey Hoggle founder of Health Project Partners. I met Lindsey on February 25th 2010 at an HIT Policy Committee Adoption/Certification Workgroup that my friend e-Patient Dave De Bronkart was submitting testimony to. As an added bonus, my friends Cindy Throop and Claudia Williams were also in attendance. There was an incredibly think packet of testimony that each attendee was given to read. As I perused the pages of the document, I was dismayed to see so few visuals. Dave was one of the only people that added cartoons support his points. As I vented my frustrations, Lindsey was seated behind us. I met Lindsey at a session break, she seemed really nice and she had lunch with us. I would meet Lindsey at many health meetings in the subsequent year. I would speak on a panel that she assembled. And I found out quite a bit about Lindsey Hoggle the person. She is the opposite of stock photography. She is real. 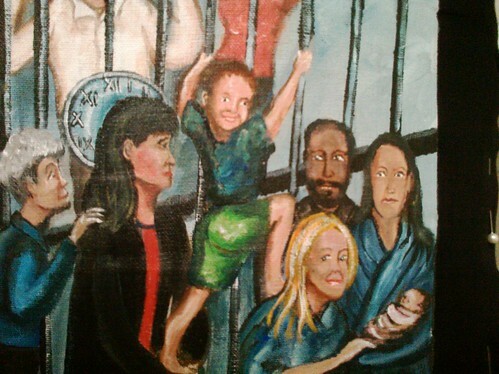 In this panting Lindsey is in the center. In her work, Lindsey is in the background. 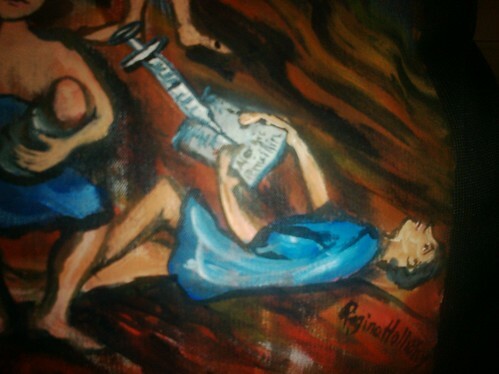 She lets others seek the spotlight while she works diligently for change. 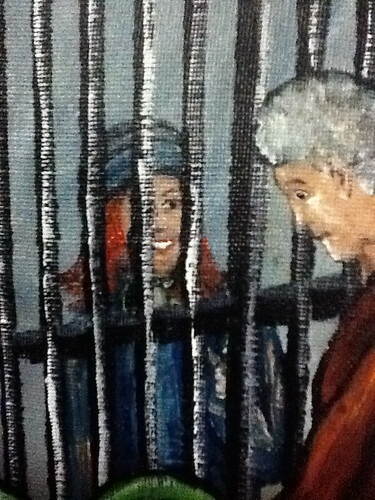 But within this painting all eyes focus on Lindsey. That is very appropriate, because Lindsey is the center that her family orbits around. She is the sandwich generation, caring long distance for her parents. She also is a single mother, providing succor and of financial help to her four children ranging from 25-14 years of age. 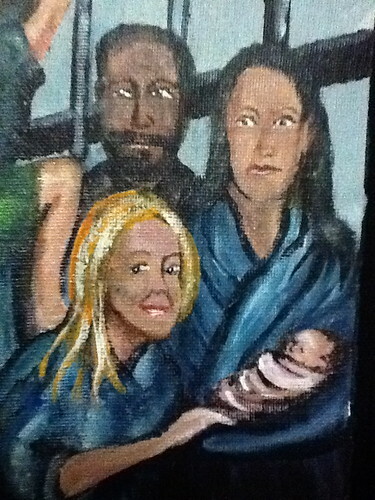 In this painting Lindsay has a halo. That halo is a clock face. This halo represents the long days and nights Lindsey works in the world of healthcare so she can help support her family. 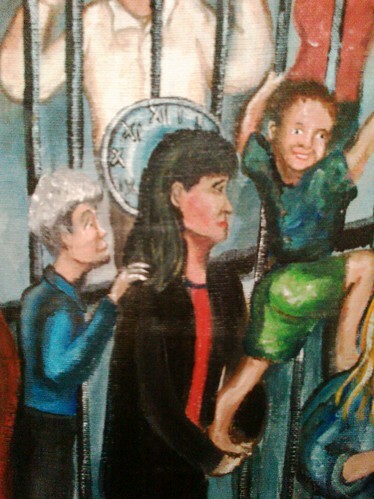 Her hands are laced together to provide a leg up to her grandchild. Lindsey’s grandchild is trying to climb a fence. This isn’t some fun climb upon a neighbor’s retaining wall. This fence is at least 10 feet tall, wrought iron and imposing. It represents divisions, within economics, healthcare access and class barriers. Two of Lindsey’s children have successfully made the climb and have begun the descent to the other side. To make matters worse, as these climbers attempt this feat, there is water rising all around them. This dark expanse of water is filled with floating debris. Keyboards with stethoscopes float by this struggling family. Lindsey’s family ignores this symbol of health information technology, as their worries about rising water and little choices, drown out all desire to learn about a new system of care. 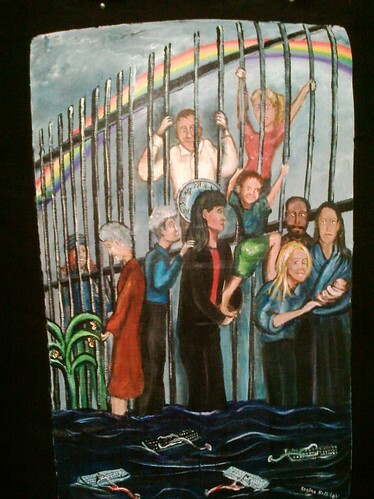 To the right of the painting, Lindsey’s eldest daughter stands surrounded by family. In her arms she holds her newest baby. Her eyes engage the viewer, as if to ask, “What will you do to help us?” I cannot help but worry about this mother. How will she climb with such a small infant? 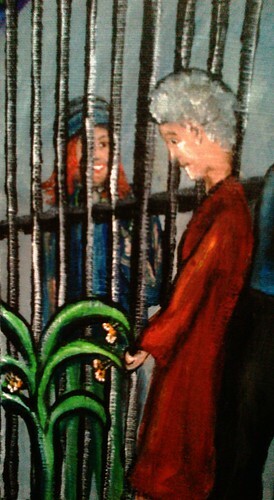 To the left of the painting, Lindsey’s parents stand. Her father gently taps her shoulder. He has a worried expression on his face. Her mother has turned away and studying a plant beside her. Under many leaves of this plant, butterflies are roosting. They are trying to save their wings from the brutal rain that has created this flooded scene. Behind the wrought iron fence a rainbow expands across a sodden sky. And to the far left behind the fence an oblivious stranger who saunters by. You might recognize her. She is “The Everywhere Girl.” She is the queen of stock photography. She was used in multiple ad campaigns starting 2004 and she still occasionally turns up in a new one. She has made to the other side of the fence. She gets to live in the world with the rainbow. She doesn’t seem to see the troubling circumstance that Lindsey’s family finds themselves in. There is a good reason for that. She isn’t real, just like the rainbow she is an illusion. She is this vision of a perfect college girl starting off her new life. Lindsey and her family are real. Lindsey is doing her best, to keep her head above the water and support her family. She works so hard to provide for them all. The world of health is made greater by Lindsey’ presence. She has taken her cue from the butterflies and learned some valuable lessons in regard to the world of health information technology. Expect great change in your life and be ready for the time of metamorphosis. Protect your fragile wings from the storm. You will need them when it is time to fly. 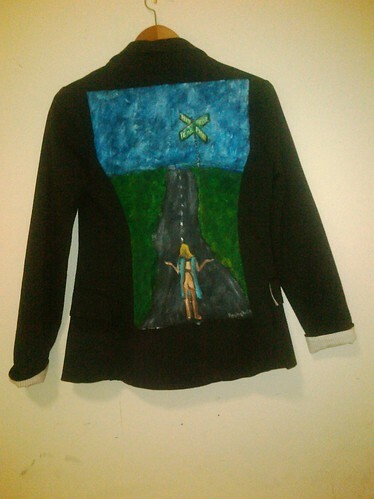 As I painted jacket after jacket in the month of May, my little five-year-old son Isaac waited. He waited for his snack, he waited to play, he waited for his story time and he just waited. 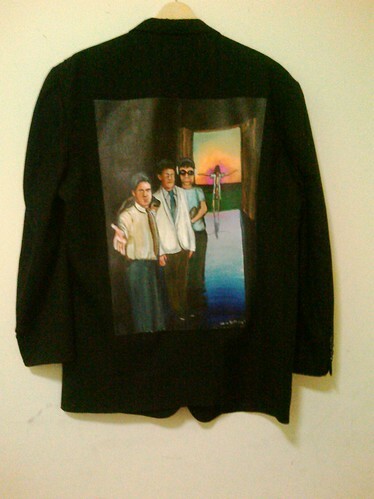 One day he stood beside me, looking at the painting on a jacket. He stared at the kitchen that had become a studio. He was waiting. “Yes, Isaac?” I said in a slightly dismissive tone as I blended the colors within an image. And so Isaac joined the Gallery. 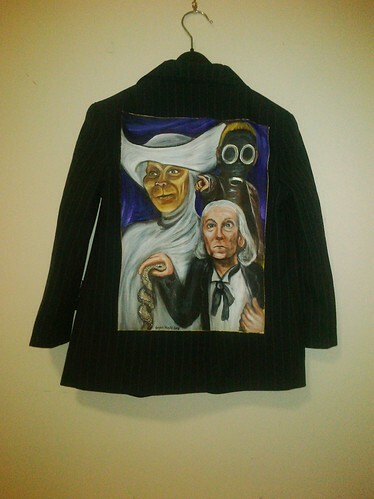 This is Isaac Holliday’s Jacket: “Doctor Who in Medicine." Isaac has been watching Doctor Who since he was three. In the Fall of 2008, we watched every episode of the new BBC run as a family. It was the most joyful time. We celebrated Freddie’s birthday (Isaac’s older brother) with a Doctor Who party. We and our friends dressed as the characters for Halloween. For Christmas, Freddie got a Tardis playset and Isaac got a Cyberman helmet. And then came January, Daddy was sick and tired. And Isaac waited for Daddy to play with him. But Daddy hurt. In February, Daddy felt worse. Isaac waited. In March, we gathered up the family and a bag of Doctor Who action figures, and went to the ER to see why was Daddy suffering so. Daddy waited, Mommy waited, Freddie waited and Isaac waited for three hours in that beautiful waiting room. We waited three hours to be sent home with pain medications. By the end of the month, Fred would be admitted to that very same hospital and he would never walk again. Isaac would sit on the floor next to Daddy’s bed playing with toys. And sometimes Isaac would crawl up into Fred's bed. He would nestle there carefully within an embrace of arms and IV lines, but Isaac remembers he accidently hurt Daddy with his shoes. This picture is of that moment. Isaac didn’t really ask for much. He just wanted you to hold him. He would wait for that. Sometimes, Isaac asks me if Daddy is still dead. Sometimes, Isaac waits. I am glad Isaac stopped waiting and started walking. I bet Daddy is glad too. Ash Wednesday fell on March 9th this year. I was really busy. I had just finished two school auctions in the month preceding; doing 10 auction art projects with 160 children at one school and 12 other art projects with 500 students at another school. I had attended an Institute of Federal Health Care Round Table the week before and the very next day I would fly to Bellin Health in Green Bay Wisconsin to present a speech. I was busy, but I was thinking very carefully about Lent. You see, I was having trouble with the whole concept of giving something up for Lent. When I read the words of the Gospel, I hear a lot more of go, do and walk. And not so much of the thou shalt not or the do without. It seemed more about breaking bread with each other and not so much about removing chocolate from our diet. 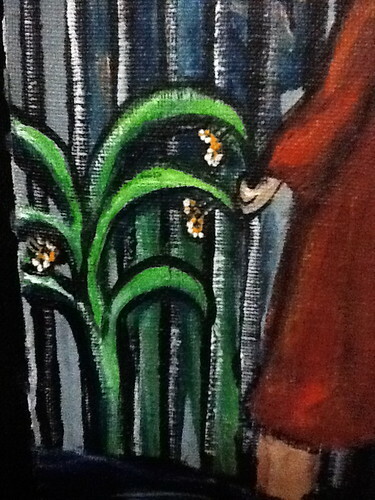 I felt that Jesus had a greater “ask.” So for Lent, I vowed to do more art. 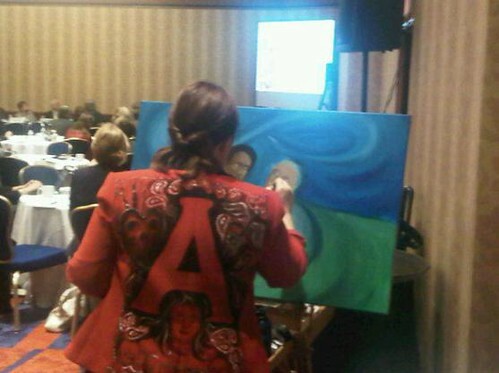 I would ask every conference planner if I could paint on site (and sometimes I would just show up with easel in hand.) 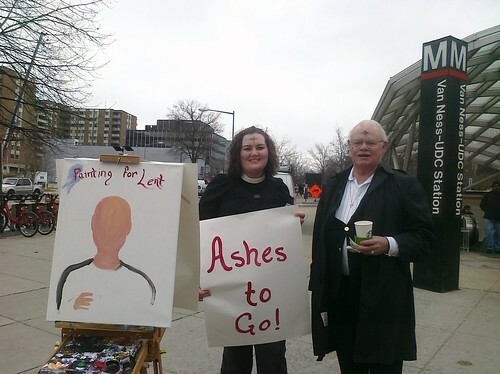 When the Evangelism team and Vicar Cassandra suggested imposing ashes on the foreheads of the Metro commuters, I leapt at an opportunity to fulfill my Lenten pledge. Vicar Cassandra Lamb is finishing up her year with us at Saint Paul’s Evangelical Lutheran Church in Washington DC. This past Sunday she presented a Sermon referencing her experience that day. This is from the Sermon “GO!” on her Blog: Preaching Bytes. I am glad I went out with Vicar Cassandra that day. 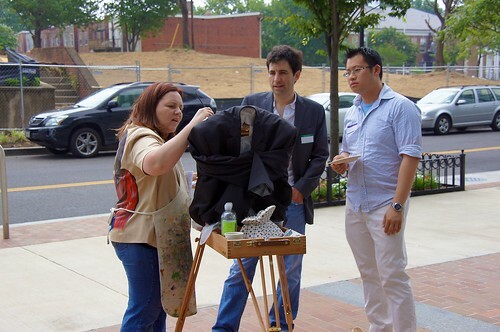 I am sure that my presence at the easel helped some folks conquer their fears and talk with us. 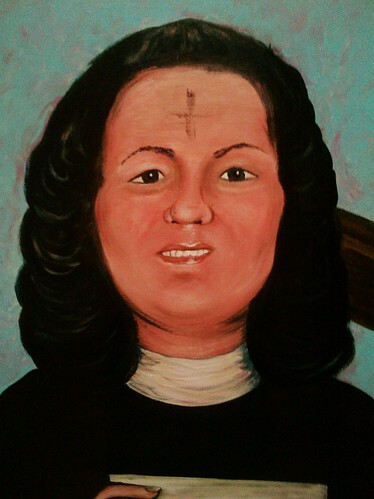 I am honored that I had the chance to paint the serene countenance of Vicar Cassandra’s face. I am glad my Lenten Journey led to creating more individual art works in the past four months than in any other time in my life. 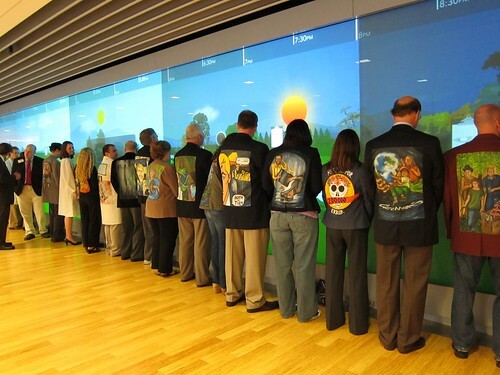 I thank God for the inspiration to ask Kaiser Permanente if we could have The Walking Gallery. 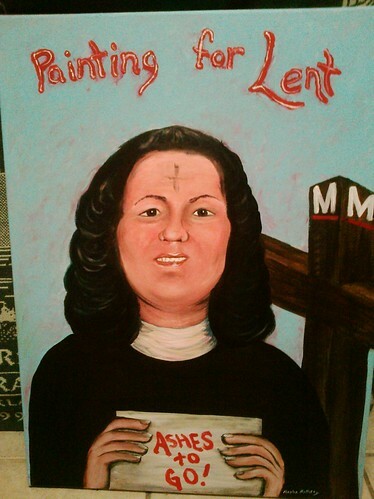 I am not sure that the Gallery would have happened without this Lenten pledge. “I will see you in Galilee, Galilee, Galilee. I asked Pastor what did Galilee mean? “Other than the place?” he said. Yes, what does the word mean? He did not know. So after service, I went home and looked it up online. Galilee means the ring, the circle the circuit. 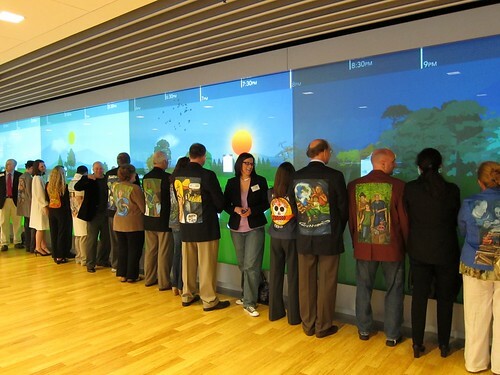 Do you think God chuckled the night of The Walking Gallery? Do think God smiled as we circled the smart wall time and time again and created a little touch of Galilee in Washington DC? Have you ever met Leah Marcotte? She is young and slight. I met Leah at a meeting at Department of Health and Human Services. She is very involved in providing the medical student perspective to the ONC and CMS. She focuses a lot of her energy on HITECH and Meaningful Use. And she is blank slate. I mean her jacket was a blank slate. You see Leah just dropped off her jacket with my front desk. Her first name written on it and she left no patient story. I even got her last name wrong. (I confused her last name with Leah Wiseman.) I put Leah’s jacket in the pile of jackets another artist could do, if they arrived to help in the final hours before the show. In the early evening of June 6th Robert Filley arrived to help. 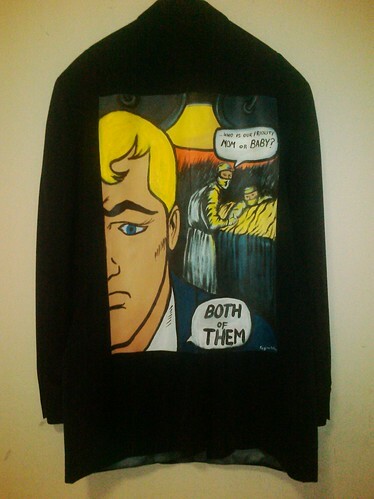 Robert is an amazing artist with a degree in fine art and I put to work on some jackets that matched his style. His style is serene and filled with vibrant color. In the late evening his wife arrived. She offered to get us food, but instead I asked her to paint. “Oh, I am not an artist,” she said, as her eyes went wide with apprehension. 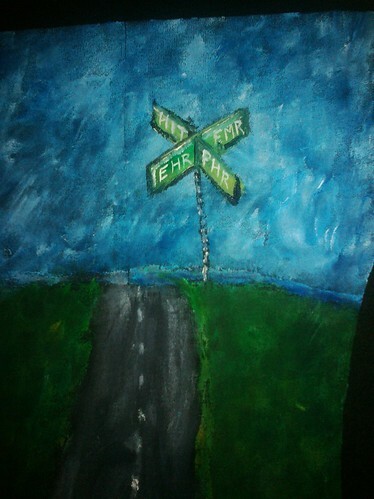 I am so glad that she was brave enough to pick up that brush and paint the background of “HITECH Crossroads,” because I can think of no one better than Anita Samarth to that job. So for an hour, the three of us painted. I was painting Christine Kraft’s jacket, Rob was painting Carol Torgan’s jacket and Anita was painting Leah Marcotte’s jacket. 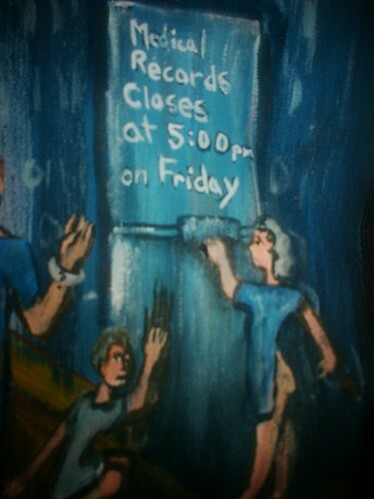 And then it was the Witching Hour and it was time for them to stop painting and head home for some rest. Then I looked at Anita’s painting. It was amazing. The sky roiled with confusion. I knew exactly what must be painted to finish this piece. 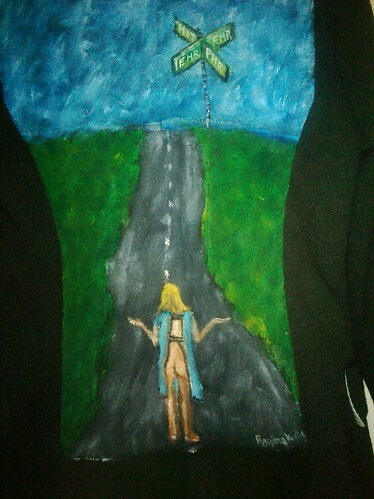 I painted a female patient staring in confusion down a highway to infinity. Upon the horizon is a street sign listing the various paths. The sign is slightly askance. Our patient walks in the middle of a highway labeled PHR (Personal Health Record) this shall soon merge into HIT (Health Information Technology.) I wonder is our patient in danger of being run over by a speeding motorist in the PHR lane? No, I decide, it seems as if this path is mostly abandoned. Upon the horizon, the sign directs us right to an EMR (Electronic Medical Record) or left to an EHR (Electronic Health Record.) From the patient’s perspective, the EMR/EHR road cannot be seen at all. All the patient can see is a slightly bent sign on a lonely road beneath heavy sky. She doesn’t even know what those acronyms mean. 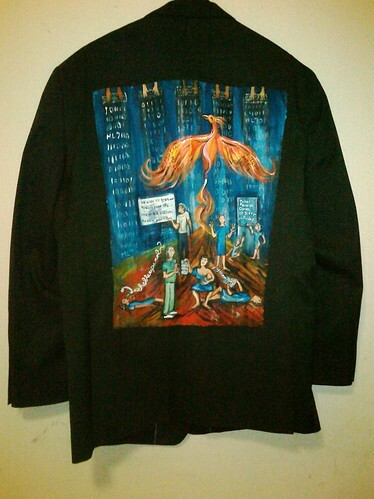 This is Leah Marcotte’s Jacket: HITECH Crossroads. 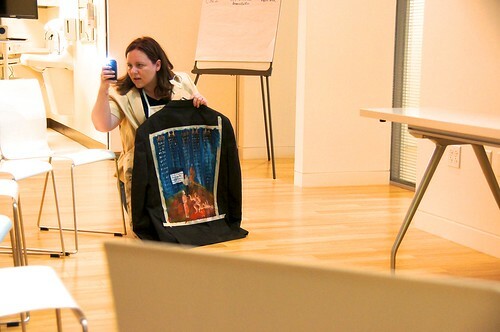 She is bright and funny, but in the pictures from Walking Gallery she is anonymous. The only picture I have of her is her back. If I search for her on Google, I only find transcripts of phone calls or medical student rotation lists. On twitter her avatar is an egg. Where is Leah's Face? You see, Leah personifies her jacket. She is important. She has a voice. And people like Leah will create the future in medicine. We may not see her face. We may not know her name. 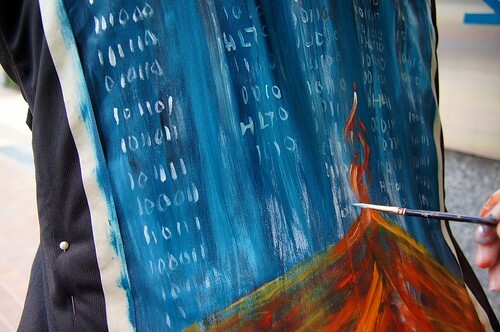 But she is creating the background of our HITECH reality, with as much power and emotion as Anita did. And if we want full consumer participation in EHR adoption, we shall need patients and caregivers to as brave as Anita was. They must be willing to pick up the brush even if they feel out of their depth. The first step to creating a Masterpiece is being given a chance to use the media. We are all artists inside, let's paint a healthy connected tomorrow. Do ever think of animals or fictional characters can well represent the personalities of new people you meet? I often do. It helps me remember them and their personality. When I first met Matthew Browning it was on Twitter and I knew him by his description: Founder YourNurseIsOn.com, CEO Targeted Instant Communications, Inventor IntelliBlast Communications System, RN, MSN, FNP, Healthcare 2.0, Husband & Daddy, :-) When I met Matthew in person I thought of the 1984 film: The NeverEnding Story. In particular I thought of the character known as Rock-Biter. This character is tall and strong with a deep rumbling voice. It was a perfect fit for Matthew. This is the way I saw Matthew and until he told me his story I did not know why. “Just over 3 years ago, late on a Friday night in March, my wife- who was 31 weeks pregnant-experienced difficulty breathing while we were in Florida. We were on a "rub the belly tour," so that our families could celebrate her pregnancy and impending birth of our first child. Upon arrival to the local ER, we were informed that she was eclamptic and we would have to deliver our baby TONIGHT, right now, no delays! “Whoa!!! Hold on a second, you mean right now?” I said in disbelief. The doctor came and explained that they needed to operate as soon as possible, the risks involved for my wife and my unborn son, and the real possibilities of very poor outcomes. I explained that our doctor in Connecticut would need to speak with this doctor due to my wife's rather complex medical history and significant risk factors. They, the doctor and assistants, made every attempt to dissuade me about the need for that consult and the need for this doctor to review her medical history BEFORE operating. I was resolute, and at 6am on a Saturday morning, we received a fax of my wife's medical record and two consults, one from her OB and one from her hematologist. These actions likely made all the difference in our outcomes. Phoebe's hematological risks complicated the procedures, planning and course of the emergency C-section needed to deliver our son in the safest manner possible. Proceeding without this information would have been very dangerous and likely life threatening. Relieved that we had done everything we possibly could to ensure the safety of Phoebe and our son, I gave Phoebe a kiss and she was wheeled into an emergency c-section. As the doctor and I followed behind her, the doctor pulled me aside and said, "this is a very risky procedure with a complex patient- if there are any complications during the operation…who is our priority? Mom or Baby?" In my 10 years of professional nursing, through countless life and death emergency situations, I had never been so completely unprepared for a situation, so at loss for words nor so completely devastated as I was in that mille-second of indecision. How do you answer that? What could I say? Why was the room spinning, why were my knees buckling and why couldn't I see straight? OMG! Here was the WAY to real possibility that my wife, my son, or possibly both would not make it through the morning! In disbelief, I struggled to gasp "BOTH OF THEM!" With a grunt, the doctor wheeled about and left me standing in the empty hallway, slumped against the wall, disoriented, distressed and summarily dismissed- drowning in my uncontrollable tears and the inhumanity of our healthcare system. AJ Browning was born at 31 weeks, 3 lbs 11oz, after nearly a month both he and Phoebe were able to leave the hospital and come home. He is a 44lb 3 year old in the 97th% and Phoebe is healthy and expecting our second child in October 2011." I painted Matthew’s jacket in a very different style than my usual work. 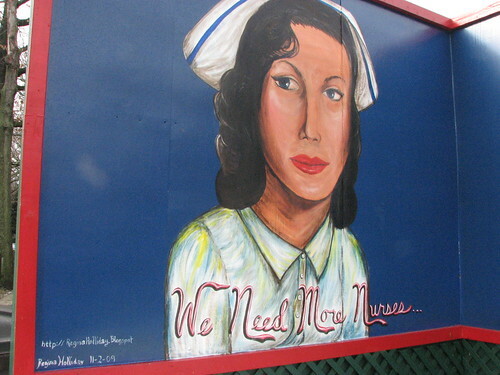 It is loosely based on the pop art of Roy Lichtenstein and the comic art in the Marvel periodical of the 1970’s called Night Nurse. I chose this format, as our culture often under-appreciates the emotional power of the graphic image. So in this frame I imagine the frantic nature of the surgery room. The larger than life version of Matthew’s head takes over the frame. He is voicing his refusal to choose between his child and his wife. He tells the room, he tells the world, to save both of them. Then he sinks into despair. I wonder if he looked upon his hands as Rock-Biter had. Those strong hands had nursed so many, had helped many others, but at this moment they were empty. And Matthew was so very alone. 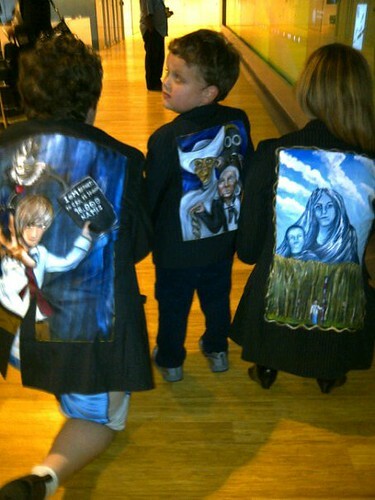 I am so glad that Matthew joined The Walking Gallery. Each Day he walks in his jacket he will spread his story and spread awareness of the potential of advocacy and the importance of treating people with compassion. He is one of many. We are no longer alone in our suffering. We are a great and mighty wall. Once upon a time I did phone solicitation, so I was not going to brush off Matthew. A cold call is a really hard thing to do. But I was kind of busy, so I said, “I would love to help out but I am painting non-stop for a gallery show in less than two days. Could you call me back?” Mathew said he would. Then I asked Matthew, “Would you come to the Gallery Show? It will be from 6:00-9:00 Tuesday night in the new Kaiser Center for Total Health near Union Station.” He said he would try and I hung up and went back to painting. The gallery show was a smashing success. Mid-way through the evening, a tall thin young man I did not recognize came up to me. I was so happy. There were a lot of people I was happy to see at the Gallery, and I met many for the first time. But Matthew took a leap of faith. He had cold called me, and was willing to listen to my request and not just stick to a pitch. 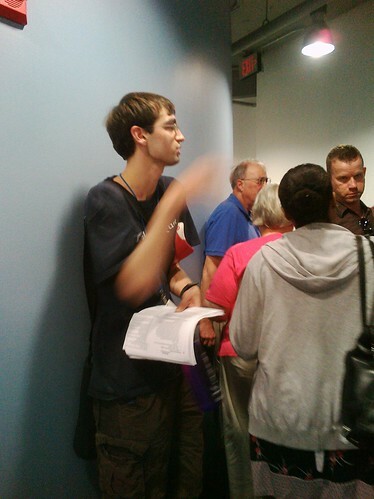 So yesterday, I volunteered with Organizing for America to register voters in Virginia. 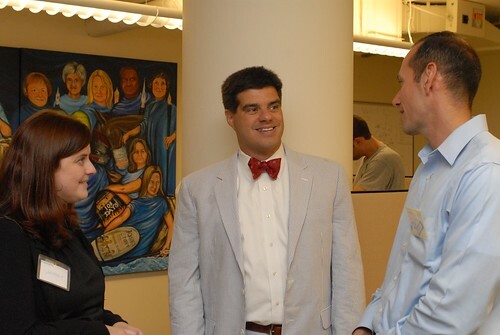 I met a lot of dedicated volunteers and staffers like Matthew Metz and Kouri C. Marshall, who was recognized in 2009 by EnVest Foundation as one of the top "40 under 40"leaders in The DC area. 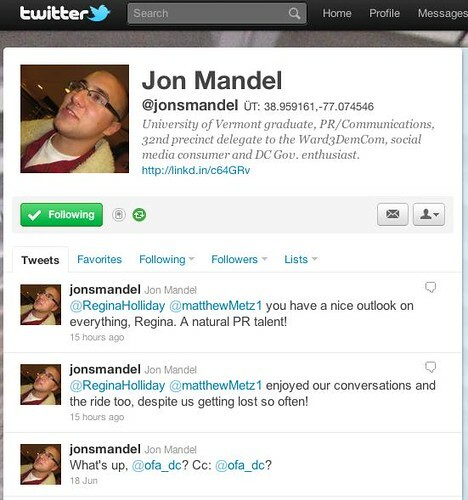 Mathew told me we would be riding with Jon Mandel. We took a very winding and slightly confused path trying to navigate the interstate and the massive road construction. The great thing about the trip was its circuitous nature allowed for wide-ranging discussion. Because of this, I found out Jon works for Ketchum and is part of the PR push for consumer awareness of Electronic Health Records and their great potential for improving medicine. We then left Matthew somewhat behind in conversation as we talked about Lygeia Ricciardi , Josh Seidman, Ted Smith and Farzad Mostashari. Matthew joined back in when he began describing patient stories within his family. I promptly followed both Matthew and Jon on Twitter so we could continue this conversation online. We finally arrived at the rally point to encourage Virginian’s to register to vote. The Virginia Fairfax DNC folks wanted us to drive to the Vienna Metro to register folks. We were rather upset by this. Why had we had driven such a long way to drive to a metro? We could have used metro to participate. Then I looked at the forms we using, they were all available online. We could have printed these out at home or at the DNC in Washington and spent more time registering people. We finally ended up trying to register voters at a local mall. We did our best, but Matthew was the clear winner in getting the most forms filed out. On the way back to DC, I checked my email and I saw another vote was happening online. Modern Healthcare.com was hosting a vote for the 100 Most Influential People in Healthcare. I was very excited to see many of the names on the list. But alas you can only vote for 5 of those listed. As I looked through the list I was happy to see Don Berwick, Maureen Bisignono, Carolyn Clancy, Charles Denham, Lucian Leape, and Farzad Mostashari. But as I began checking through the list of 300 plus names, I saw very few of them had accounts on Twitter. I decided to start sending out tweets in support of voting for Farzad and Chuck because they are really cool and understand the patient voice. But also they are embracing social media and the give and take relationship that mode of communication requires. 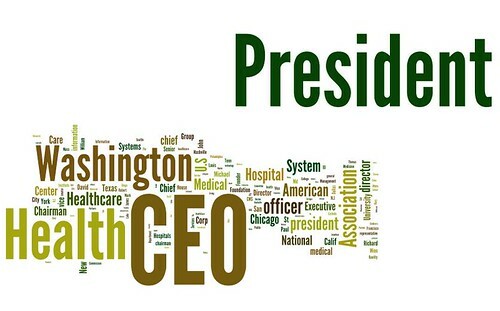 I created a Wordle of all the names of those nominated with their titles. 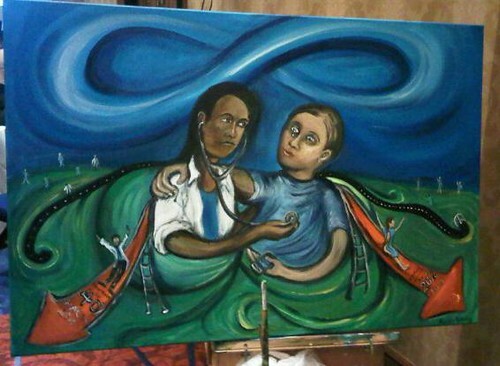 Do think this is an image of what influences us in Healthcare? I think we are on the cusp of great change within healthcare. A top down influence paradigm is changing into one of connectedness. As we travel father down this path of shared decision-making, social media in healthcare, and the Partnership with Patients, we will all need people to consider embracing new titles and tools to truly influence healthier decisions. Please consider voting for Farzad Mostashari and Charles Denham as 2 of the most influential people in healthcare, because they tweet. Because they talk to all of us and like my new friends Jon and Matthew, they are meeting with us where we are. I have two names. I have always introduced myself as Regina. Once, I was Regina McCanless. Now, I am Regina Holliday. But to my late husband Fred, I was someone else. I was Reggie. I was Reggie who worked in a Toy Store and read books with him on dates. But when Fred died, I put Reggie away. Oh, the folks who knew from years before and had met me through Fred still called me Reggie, but no one in Health 2.0 or patient advocacy did. And that was okay, because Reggie died with Fred. That is no one in my new world of advocacy called me Reggie, until I met Chuck Denham. I guess he saw my email handle and figured out my other name. He began calling me Reggie and I called him Chuck- not Dr. Denham. Then he began introducing me to others as Reggie. I got some strange looks from Health 2.0 friends who always knew me as Regina. 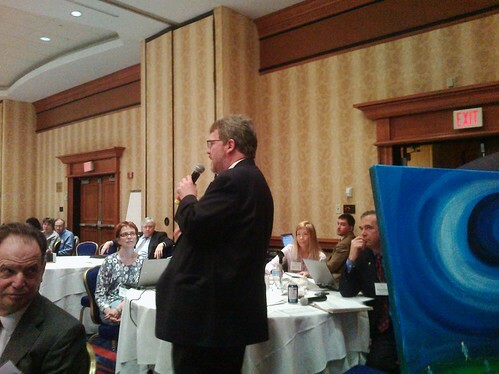 Then Chuck introduced me as Reggie before the assembled crowd at The Partnership for Patients-NPP kick-off Meeting in Washington DC on June 16th, 2011. Everyone began calling me Reggie, just as Fred had. Today is the second year anniversary of Fred’s death. I am sure Fred would be proud that his Reggie represented the Patient Voice in such a meeting. And I am really glad that I had the chance to attend, but 24 hours before I wasn’t invited. I got an invitation to participate from John O’Brien at CMS on Wednesday evening. I met John last July at my e-Patient Ephemera Gallery Show at Clinovations. He spoke with me briefly and I began to follow him on twitter. 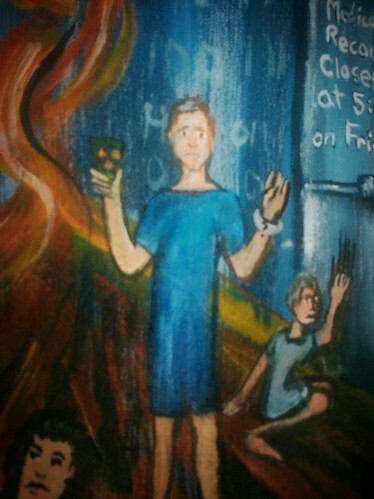 In March, I met him again and asked him if he would be interested in participating in a new patient-centered art action called The Walking Gallery. He said he would love to. He dropped off his jacket, but alas I did not get to it in time. He walked with a fail whale on his back and I promised to paint his soon. I told John I would love to attend the meeting and paint on site as well. He said yes I could paint. 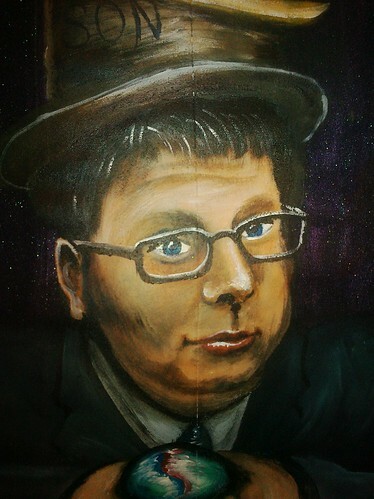 I told him I would paint his jacket that night. This is John’s jacket: A New Day. 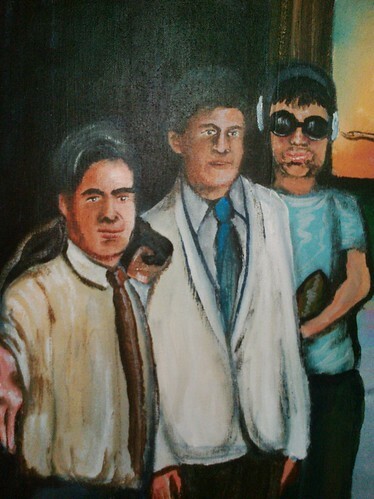 In this painting there are three John’s. The John in the back was from years ago when he worked in sports broadcasting. The next John is becoming interested in medicine and is studying pharmacy. The final John is working at CMS and is involved in national health policy. This John holds out a welcoming hand and invites the patient in. In the background, a patient stands. She stands on the threshold of an open door. Her arms are raised as if embracing a new tomorrow. She has been invited in. When I arrived at the meeting, I handed John his jacket. Which he promptly dressed into and wore for the remainder of the meeting. I was wearing my “Little Miss-A-Type-Personality” jacket. 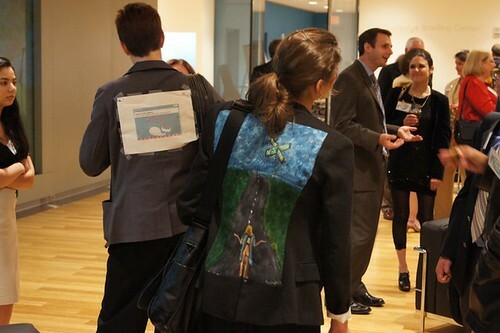 So there were two uniformed members of The Walking Gallery present. I set up my easel and began painting. Everyone seemed very receptive to this. I began by redefining the logo of the Partnership For Patients. You see the current logo depicts doing something to a patient rather than working with a patient. 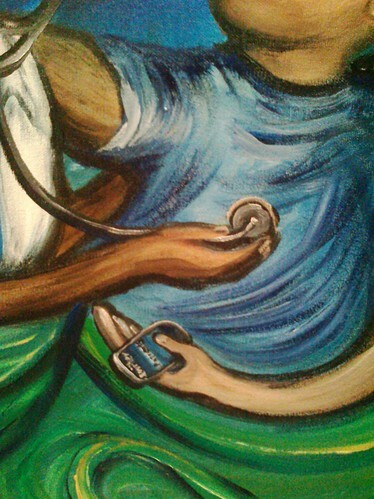 So within the painting I painted the Doctor checking the patient’s heartbeat. And the patient is embracing the Doctor and providing emotional support. As I was painting this part, Helen Darling and Bernie Rosof Co-Chairs of the National Priorities Partnership were speaking. 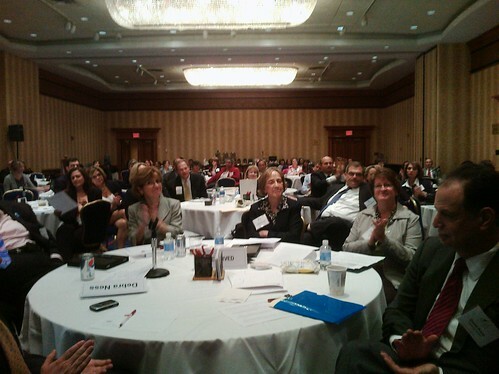 Soon Carolyn Clancy Director from AHRQ was up next and then Joe McCannon Senior Advisor, CMS. Both of them said some very powerful things about the potential for positive change if we all worked together. Next Dr. Paul McGann and Dennis Wagner spoke and they were dynamite, they lit the room with their energy and passion for the partnership. 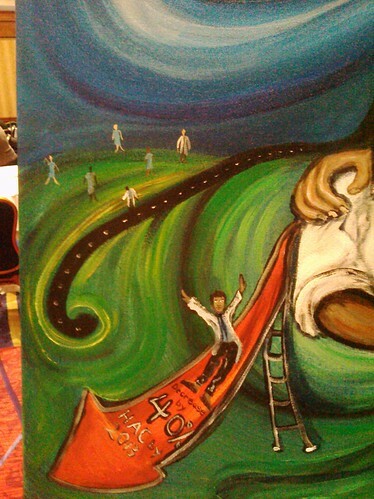 I continued painting while they recognized my presence within their speeches. Around 10:00 am Debra Ness, from the Partnership for Women and Children spoke. I was so glad to see her speak again and hear her amazing passion. I had just seen her present at the Annual National Partnership for Women and Children Luncheon on June 9th, and she was just as dynamic at this event. Next up was Richard Foster informing us about happenings in South Carolina Hospital Association. Mary Eagan from Honeywell presented a strong business case for supporting the Partnership for Patients. And then the driving change session was finished by a presentation from David Pryor from Ascension Health. 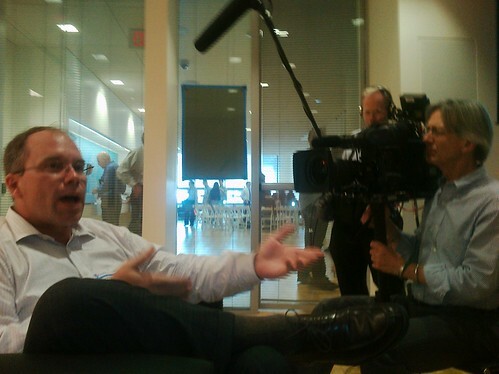 At this point I was pulled aside to speak backstage for a few minutes with Don Berwick. I said how much I enjoyed seeing him again. 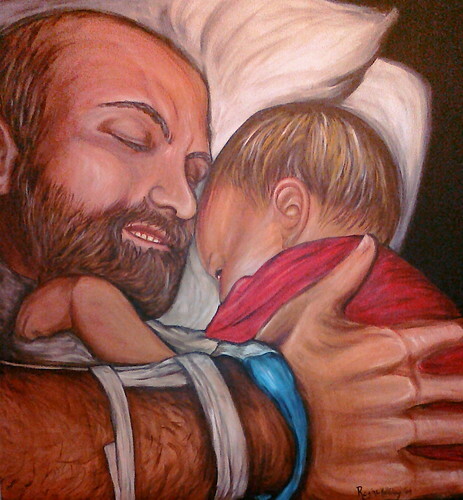 Then I held his arms in mine as I told him that millions of patients were praying for him. I locked my brown eyes with his hazel ones and told him to never give up. I watched his eyes shine with sheen of unspent tears, for all the Ann’s, all the Fred’s and all those that suffer on this day in the current system. He asked me if I would like to come up to the podium and speak during his allotted time and I said yes. 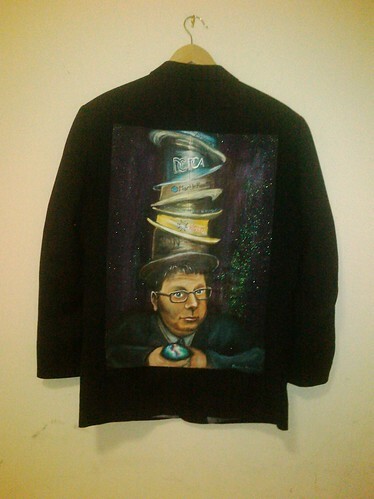 I also told him when he was ready to join The Walking Gallery I would paint his jacket. 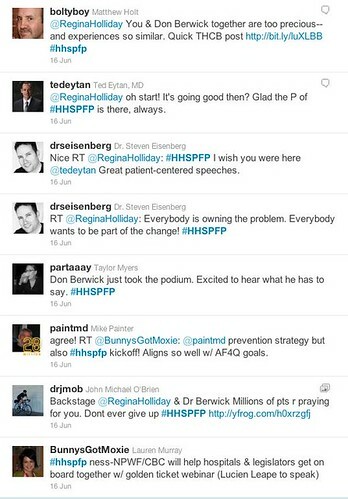 Not long after Don Berwick called me to the front of the room. I spoke of Fred and medical record access. I spoke of the power of involving the patient and caregiver in medical model. I explained the name given to me by an uncaring doctor and then spun around to show them I had embraced the term “Little Miss A-type- personality. I explained that if we could have had daily and realtime access to his medical record Fred would have gotten better care. I ended with a call to action asking them invite patients and caregivers into the team. Soon the afternoon session began. 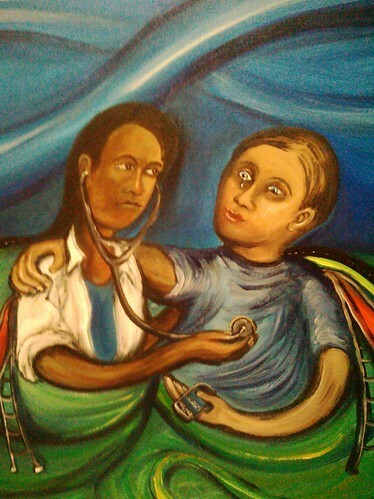 I painted the dual goals of the Partnership for Patients: a 40% reduction in Hospital Acquired Conditions and a 20% decrease in readmissions by 2013. And I depicted them as children’s slides on a playground. The afternoon session was filled the ideas of attendees. Everyone began networking and sharing thoughts and making individual commitments to what they would do to help. Chuck Denham stepped forward and mentioned the Patient Speakers Portal that TMIT is creating with the help Trisha Torrey, myself and other amazing patient activists. Each person stood to offer his or her commitment. One gentleman stood saying, “I didn’t know I was coming to be part of an altar call.” The crowd laughed, but I have never heard a statement more true. There was such a spirit of giving in the room. 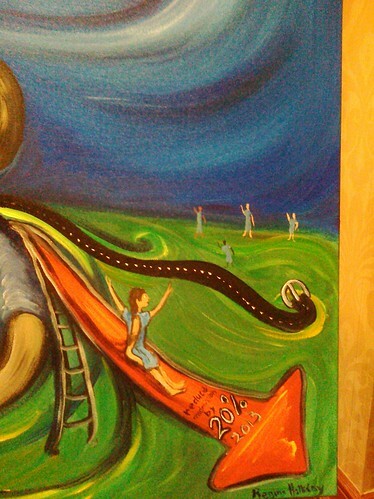 I painted a joyous doctor sliding down the 40% reduction slide. 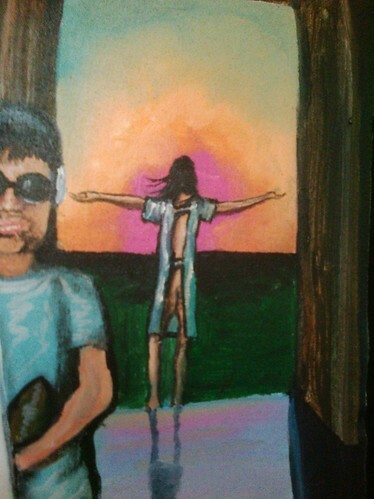 I painted a patient waving and looking over her shoulder at patients far off in the distance. Soon it was time to conclude the meeting and I was asked to come to the front of the room and do a short speech explaining the painting. First Paul McGann and Dennis Weaver spoke summing up the power of the day. Before, I spoke someone asked what was the “thingy that would hold this six pack together.” Would we email, create a list serve? What would it be? I began to speak. I asked those assembled, “How many of you are on Twitter?” A smattering of hands rose. I said, “Look at this painting. Do you see what is in this patient’s hand? 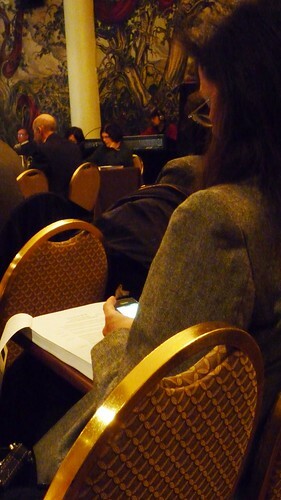 That is a smart-phone and this patient is live tweeting from her appointment. You ask how will we spread the message? Do you see that belt in this painting, and all those people standing…. outside the Beltway? You want to know how we will stay in touch and spread the word? We will do it by social media. I bowed my head in thanks to all those amazing folks, as the audience rose to their feet in applause. And 24 hours earlier, the patient voice hadn’t been invited. See what a difference a new day makes. 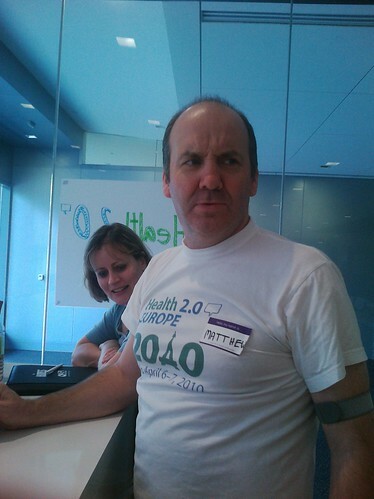 On Saturday June 11th, I planned to finish up Health Innovation Week DC by attending the Health 2.0 Code-a-thon. I had never attended a code-a-thon before and thought I would attend as an artist. I also thought I would kill two birds with one stone by painting Keith Boone’s Jacket (@MotorCycle_Guy as he is known on twitter.) You see Keith is a HIT standards geek. He codes. He stays up writing standards. He doesn’t sleep so you and I may have a better chance to live. I had been following him on twitter for quite some time, but I came to his attention due to a twitter stream that talked about The Walking Gallery. Keith is rather famous for wearing a vest to coding and health events and he was willing to trade in his vest for a jacket. Keith mailed me his jacket and I put it in the ever growing to do pile. 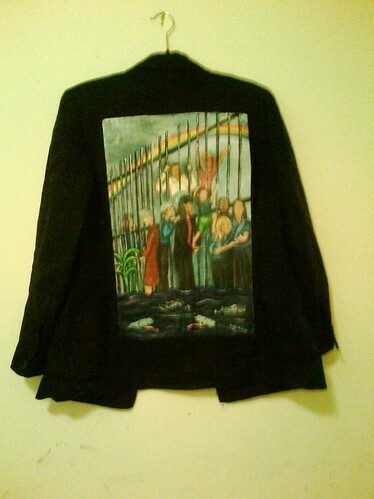 Although, I worked almost non-stop in the week leading to the Gallery, I did not finish some of the jackets. Some people were coming in from far away to be walkers. I had let them down. I wondered how I could make them laugh rather than frown when they picked up a blank jacket. Then an idea came to me. I could print out custom fail whales to attach to the jackets. Most of the Walkers were on twitter so they would surely get the joke. You see twitter often gets over capacity and then you are greeted with a fail whale and you cannot be part of the twitter feed. 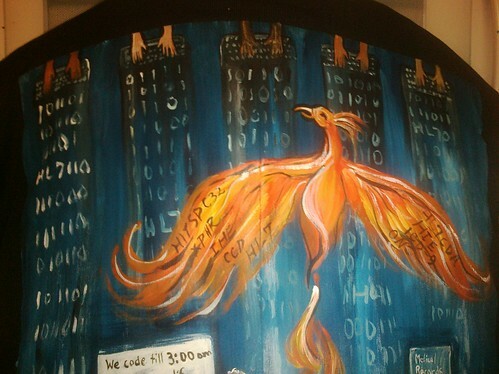 When Keith saw this he laughed, and walked the Gallery wearing his fail whale. Later in the evening, Keith told me he would love to have his jacket by Monday the 13th, as he would be back in DC to give a speech. I told him I would get it done. The only problem was that I was booked solid for the next few days during Health Innovation Week DC. As I began to run out of time, I had an epiphany before the Health 2.0 code-a-thon. I would paint Keith’s jacket at the event. After all, Keith is deeply immersed in the world of HL7 code. It would be the perfect environment. I lugged my easel and supplies to the KP and asked about setting up. The Health 2.0 crowd waved me to the main room, but the building director came around a corner and told me the sad news: I would not be allowed to paint. The floors of the center are recycled soft wood and they are very easily damaged. But I was determined to be present as an artist, so I came up with an alternative plan. I would set up my easel in front of the building. My friend Ted Eytan was worried I would get too hot or feel too out of the loop, stuck outside the main event. I would be just another patient left out of a meeting about health. But it was an amazing morning. As I painted Keith’s jacket I saw so many things. I saw the center’s security guards gently direct ill patients to the member entrance a few yards away. I saw pedestrians walk past me and engage them in talks about their health. One delightful lady was a friend with a New York Times reporter and she took my card. Another lady was so intrigued by the concept of the code-a-thon she even joined the event for about an hour. 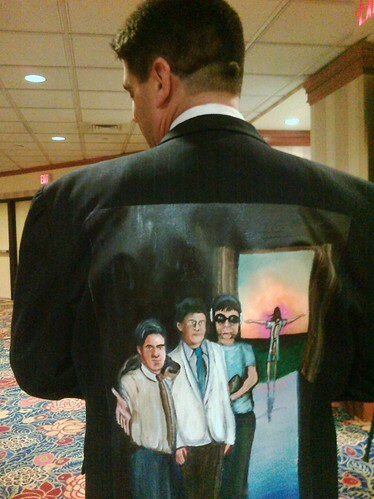 I spoke to many wonderful “regular people” while I painted Keith’s jacket. “In 2001, I was having some jaw pain. Finally sick of my hearing about it, my primary care physician sent to an Ear, Nose and Throat specialist. He was able to diagnose my jaw pain as being tooth related - but he noticed an anomaly on my thyroid. First was the ultrasound ... and then the wait. Then was the needle biopsy ... and then the wait. "When can I nurse my daughter", I asked. "I know I have to pump and then dump the milk first ... but what is the half-life?" "No, look, you can't nurse again. You shouldn't get pregnant for the next six months either"
"Uh, then I am not getting this test. Find another method. "Then use it. And be damn glad that I didn't have to suddenly wean my daughter because you can't read a chart". Well, the results came back warm, so I was booked into surgery. Over and above the usual angst, I had a will to write, because my previous one left everything to my ex-husband, I had two kids to think of, one a nursing wee one, and I had no idea how I was going to cope. The Toronto East General patient advocate was heaven-sent. To the left of this scene, a Spanish-speaking woman tries to communicate via phone after brain surgery. This friend of Keith’s is an expert in privacy and security, as well as in public health. Yet, she was told that a family member couldn't translate for their Spanish-speaking mother, recovering from emergency brain surgery. They needed to use a hospital-supplied translator -- over the telephone. Above that figure stands a code-a-thon presenter. He is presenting a slide set that repeats again and again, “We code till 3:00 am to save lives. 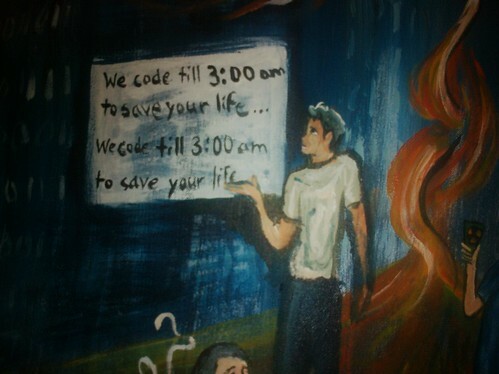 We code till 3:00 am to save lives.” And this addresses the heart of Keith’s concerns. Ironically, this friend was is a privacy expert who knows how to address the privacy requirement safely. Above all of theses sad scenes, code pours out of five keyboards as five coders desperately write code. The vignettes themselves seem to be immersed in flames. Out of those flames a Phoenix rises. Upon her wings are those letters that can change it all. Do you think a dysfunctional medical system can stand a chance against programmers who define themselves first as patients and caregivers?